Spotlight may not be your most favorite or used feature of iOS however with the improvements introduced in iOS 8 this little tool has become a lot more useful. Many users don’t bother using the Spotlight Search on their iPhone or iPad because they find it slow and crowded with irrelevant content that they do not need. Instead they prefer the direct approach of finding the content themselves or searching in the app that has what they are looking for. But little do people know that you can make Spotlight Search a lot more efficient, useful and wait for it, less crowded by following a simple tip. All you have to do is tweak its preferences by going into Settings. 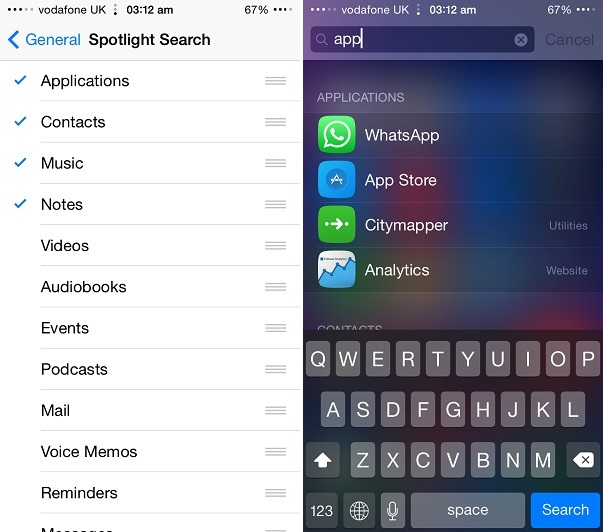 To access options for Spotlight Search simply open Settings > General > Spotlight Search. On the next page you will find a list of things that appear in the search results. Uncheck the items that you do not want to include in your Spotlight search. Another useful thing that you can do here is rearrange the list of items. You can change the order of things that appear in your search results according to your liking. For example, if you want to see apps on top followed by contacts and then Music, you can just arrange them in this order by tapping and holding on the grey anchor button on the right.